This precious image is from Digi Stamp Boutique! It is called, Bobbi and Xmas Tree. 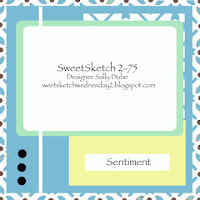 Digi Stamp Boutique is sponsoring Sweet Sketch Wednesday 2 this week! And when you play along you could be the winner of a £10 voucher to use in Digi Stamp Boutique's Shop. Remember to use the sketch below. I rotated it for this card! I also used one of my newest dies, Spellbinders Wonky Rectangle. I also just purchased the Square Curves....love them both! Papers: Creative Imaginations Debbie Mumm, Debbie Mumm Harvest and Holiday, SU Lucky Limeade, Recollections cream cardstock, Dot paper is from my stash...no name! Oh Judi ... that sweet little Bobbi is just the cutest. I like your wonky rectangles too. I don't have them, and just may NEED them now! Fabulous!! Oh how adorable is this image and your colouring is just gorgeous. Lovely to have you creating with us this week. Hi Judi it's lovely to have you back with us this week, I do miss you, Nancy and Arlana. Love your card this week as Bobbi is so darn cute and have used him in a lot of my cards especially some babies cards. Love that die you've used and your wonderful colour combo and embellishments. Take care wishing you a great week. Absolutely darling card. I love how you colored your bear and the paper combination is so pleasing. Beautiful card, Judi.